Copiosis should not be seen as defending the one percent. Rather, we’re clarifying realities. Underlying all our assertions is this: we are all culpable, creating and maintaining Status-Quo economies and associated political systems perpetuating the life-game called “earning a living”. The only way we’re going to make progressive change is declaring that game over and starting a new game. The new game is “Life” (apologies to Milton Bradley). In this new game, people are freed from earning a living and have all their basic needs met. There is no debt, no financial institutions, loans, mortgages. No government, no capitalism, no banks, or financial industry. Humans are free to pursue their passions and earn social reward income when they do things that make other humans and the planet better off. So when we say the one percent aren’t to blame for poverty, we’re looking at what has really happened. 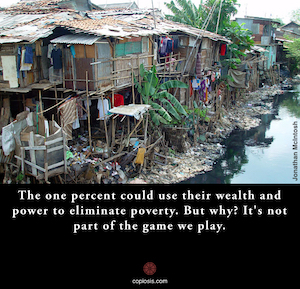 It’s true, the one percent could make decisions that eliminate poverty. They could use their enormous wealth and power to create an environment that makes being poor a thing of the past. But why would they do that? It’s not part of the game we play. There is no rule stating the very powerful must do anything other than what they are doing. This is why it’s so important to create a new system, one that works of everyone – including the one percent. That means the new system can not penalize them for having followed the rules of the previous system. By the way “the rules” of capitalism and representative politics include cheating. After all cheating is more often than not extremely profitable. It’s only not if you get caught. So how do we get rid of poverty? First we have to understand what it is. Financial writer Tim Harford, author of the new book The Undercover Economist Strikes Back gives an interesting prospective on the matter. Firstly, “poverty” is a term defined by the government as making less than $32 a day. The government arrived at this calculation 50 years ago by creating a hypothetical collection of goods needed to support a certain standard of living. They figured how much those items cost and arrived at the $32 a day figure for the income needed to earn those goods. Fast forward to today. That collection of goods hasn’t changed in 50 years. The prices have been fiddled with, but not the contents. It doesn’t for example include mobile devices, access to the internet, television or any other modern conveniences. Never mind the question “should all people own mobile phones, have internet access or televisions?” the point is, this was an arbitrary calculation based on the underlying assumption of economic scarcity, what people needed at the time to survive and how much they’d have to pay to get it. The curious thing about poverty is people’s perception of it. Hartford explains the curiosity in his book. He asserts that poverty not just an economic condition, it is a social condition too. Poverty can be about not having enough money to buy the things society expects you to have. It can also be about living a lifestyle society expects a poor person to live, although Hartford may not agree with that statement. People will think of you as poor and you’ll feel poor if you don’t have these things people expect non-poor people to have. Thus poverty has a fundamental meaning – a subjective meaning – often determined by others as they observe you. Poverty and equality are connected says Hartford. The gap between rich and poor may be measured by income. but what exactly are we measuring? Certainly not the numbers in a bank account. It could be we’re measuring access, possessions, capability, and acceptance. This is a more pernicious measure of poverty because it is ego and identity based, often reflecting upon not just what you have, but who you are and where you’re accepted. Poverty can mean a lot of things. But this latter definition causes more societal harm. Wealth inequality makes stark the differences between the one percent and the 99 percent. Obscene wealth is one thing, but when such wealth gains access to power, especially over other people, that’s when the problems start happening. Again, if the one percent today changed the game such that all our current economic problems were eliminated, the rich would be viewed differently. The problem often with poverty isn’t how it affects the rich. It is how it makes those in poverty feel when reflecting on the lives of the rich or when reflecting on people not in the same condition they experience. This is not so say those in poverty and the people who care for them don’t have a beef. But what it does mean is the feeling going on in the minds of the poor really aren’t the rich’s business. Unless we’re talking about social justice. Social justice isn’t about retribution, but caring and treating people as human. That includes the one percent. Humanity pays no attention to wealth. Having so many people in poverty or near-poverty is not socially just. It’s all our problem, not just the poor, the 99 percent, those who care about the poor. We’re positive some extremely wealthy people would prefer the poor not be poor. But they haven’t a clue as to how to fix it. Eliminate the need to earn a living. There’s no longer a need for this other than to compel people to take on debt as they are compelled to consume thereby propping up a flawed economic system. Make it possible for everyone’s basic needs to be met, no matter how much “need” a person has. Ensure that people are completely free to do whatever they feel obliged to do, so long as those acts are consistent with the United Nations Universal Declaration of Human Rights. Get rid of money as a measure of exchange. Instead, make all human connections relational as a fundamental, existential base. Reward people who continually help maintain and improved these steps as the social structure of our civilization. These six steps are impossible if we’re going to continue playing the Earn-a-living game. They are impossible if we’re going to continue to believe representative politics in any form is a good way to run societies. And it certainly isn’t possible while relying on capitalism as practiced today. This is what makes these six steps a major undertaking. Dismantling Status-Quo economies and Status-Quo political systems in favor of a better alternative is a monumental undertaking. But it’s not impossible. Obama was onto something when he talked about our technological prowess. What we should do is acknowledge that power. Then, instead of using that power to perpetuate status-quo realities, we should use that power to create a fantastically better future reality starting today.